In the Chicago area, we winterize everything. The television and radio are inundated with advertisements urging people to get their vehicles ready for winter. In addition, this past weekend, I winterized my pool for the long, cold months to follow. People are sealing their driveways, plastic shrink-wrapping their boats, and servicing their furnaces. It’s time for winter! (1) Fertilize. I recommend a good dose of 20-20-10 granular fert. The nutrients will remain in the soil and be used by the lawn in March and April. Remember, the thick blanket of snow that sits on the lawn all winter will melt in Spring … just like a nice, heavy rainfall! If you have nutrients already sitting there, your lawn will be first to green up in March/April. (2) Aerate. 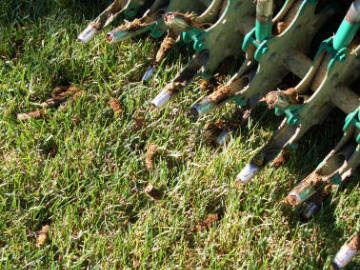 Aeration is a mechanical process wherein cores of soil are actually removed from the lawn. This removing of cores (about the size of a roll or dimes) helps to relieve compaction. It also allows the grass roots to spread out, thus thickening the lawn. The best time to aerate is now because this this is when grass roots form. (as opposed to the grass growing on top in the Spring). You can rent an aerator for about $40 for 4 hours, or call a professional lawn company to do it for about double the cost. You can also check with my friends at Service Magic and get up to 4 estimates for free! (3) Seed. This is also a good time to overseed the lawn. Overseeding accomplishes several things, but I like to generally overseed the lawn to add in new cultivars that are disease resistant. Remember, cheap seed is garbage! Buy the good stuff that has 0% weed content! (4) Edge. I recommend a good edging of the lawn using a metal blade edger. This will get all the overgrowth (the grass that flops over the sidewalks and driveways) out of the way when you go to shovel the snow. (5) Bagging. You should go ahead and bag your lawn clippings for the final couple mowings just to keep things nice and clean. You also might consider cutting the lawn 1” shorter than normal on the final cut of the season. This acts as a way to “rejuvenate” the turf in the Spring and helps avoid winter die-back of grass plants. Do it yourself lawn tips brought to you by Life and Lawns. Posted by Allyn on October 24th, 2008.